Even as a child, Simon Stock had an unusually intense devotion to Mary. While still in his teens, he became a hermit and lived in the hollow trunk of a great tree. A small dog used to bring him crusts of bread. Simon would compose poems to Mary and carve her name on trees. He would make pilgrimages to shrines of Our Lady. Often she appeared to him in visions, guiding and advising him. On one occasion, the Blessed Virgin revealed to him that some holy hermits would come from Mt. Carmel in a few years, and that he should join their Order, which was especially dedicated to Her service. As Blessed Mary and the Child Jesus vanished, the Saint was filled with joy and gratitude on seeing himself clothed in the Scapular which Our Lady had just given him. He thanked her profusely for this garment of grace and her marvelous promise. He hastened to assemble his brethren and tell them what had happened. The scapular consisted of two lengths of fabric, joined at the shoulders, with a hole in the center for the head, so that the scapular lies front and back. With this recognition given by the Queen of Heaven, this Scapular or monastic apron became a permanent and much respected addition to the Carmelite habit. A smaller form of this exists today and is more familiar to Catholics as two small panels of cloth joined by string and worn over the shoulders. The Church considers the Scapular a miniature religious habit and a highly indulgenced sacramental. After this apparition, and after numerous appeals for protection against the Order’s antagonists, Pope Innocent IV sent a letter of protection that secured the Order from the problems they encountered. The King of England also issued letters of protection and favor for the Carmelite Order. The Scapular was also officially adopted as the regular habit of the White Friars. Many were attracted to this Order during the fourteenth century and became members by way of confraternities. They then participated in the graces, benefits, and observances of the Order, and were properly enrolled in the Third Order. Sixteen popes have given their approval to this Privilege, including Pope Paul V, who issued a decree on its behalf. Many saints have also added their approval. We wear Our Lady’s Scapular as a loving “yes” to her desire that we keep Jesus as the center of our lives and bring Him to others. At the First Communion, we usually add a “new cloak” – that of Our Lady’s Brown Scapular. The beautiful custom of enrolling children in the Scapular puts them, in their innocence, under the tender care of their Heavenly Mother. 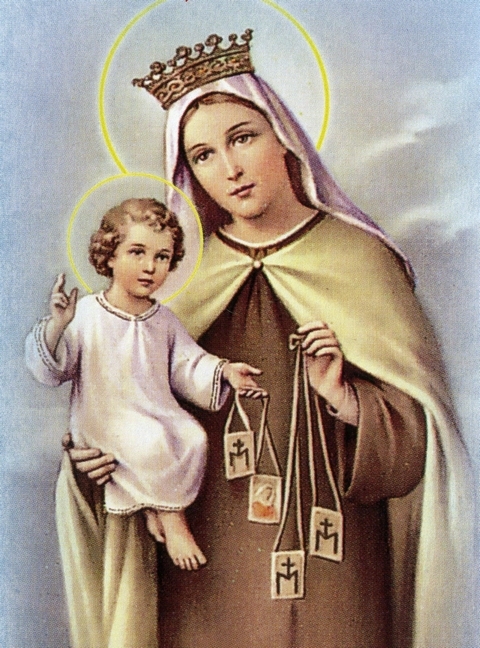 Mary wants to draw all of humanity under her protecting and sanctifying mantle by means of her Brown Scapular. She has solemnly promised us that if we sincerely fulfill the conditions of this beautiful devotion, we shall not only be saved, but she will see to it that we do not remain long in Purgatory before joining her in Heaven!